Every year National statistics get published of all the registered births and associated names that get entered onto Birth certificates. Over time popularity of names change and new names surge in popularity and become the on-trend names to give your little one. This can be a number of reasons and is often influenced by someone in the public eye such as a music/tv/sports celebrity or members of the Royal family. 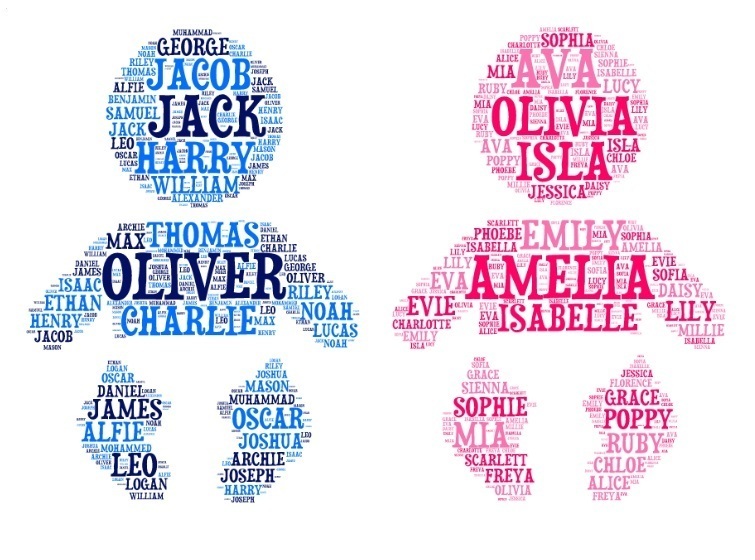 It’s no surprise to see both George and Charlotte in the top 10 for boys and girls names following the birth of Prince George and Princess Charlotte of Cambridge in recent years. Please click on the quick links below to see search results for each of the names or simply type the name you are looking for into the main ‘search here’ box at the top of the screen. The more popular or common the name, generally the higher in value these private numbers become, which is why it’s a great idea investing now for your new arrival’s future. You will almost certainly be able to buy something now, far cheaper than you could when your babies become young drivers! Simply click any of the ‘BUY NOW’ buttons and you will be taken to the order form. Fill in your details, select the ‘PAY MONTHLY’ blue button and choose the appropriate finance option for you. You will then pay a 10% deposit to start the purchase and complete your finance application on the Hitachi Capital Consumer Finance website.